Want to improve the SEO for your website? Check out what Bing Webmaster Tools has to offer you! I am being very serious. You might of rolled your eyes and thought “why would I need to focus on what Bing tells me when Google drives most of my organic traffic to my site”, or something along those lines. Well, I am going to show you seven things in Bing Webmaster Tools that are actually evergreen for both search engines to rank your content better. I also want to highlight this. The head of Bing Webmaster Tools is Duane Forrester. Why is this even important to bring up? Well, I want to draw attention to something important about Bing and SEO. Duane Forrester was one of the leads in SEO for Microsoft for MSN before Bing was even Bing. Since he leads the charge for Bing Webmaster Tools these days, you can absolutely be certain that he and his team are going to throw as many SEO tools your way since the team is incredibly well versed in SEO. In my honest opinion, I think the team truly understands how much this tool can help you with SEO in general, so that is why I want to highlight seven areas I use all the time for my own website. Google Search Console has something pretty similar to this, but I want to highlight what I look for. Obviously, I can see that I’ve had more clicks in Bing during these three months, but I noticed that I’ve also had some crawl errors this month. If Bing noticed some crawl errors, I can assume that Google might of seen some (all) of the problems too. Let’s find where these errors are now. So I have two 400 errors currently on my site according to Bing. Also, I am writing this on Wednesday, but I can see that this was crawled on Monday. Pretty recent report, so we know we are looking at pretty recent information for my site. These 400 errors will be added to my list of things to be fixed! What else can we look at within this report? There is actually a way to help speed up the crawl for a particular page on your site with Bing. Let’s say I updated a page on my site, but I want Bing to see these changes perhaps sooner then they might with their normal crawl through my site. Is there a way in Bing Webmaster Tools to do that? The answer is most certainly YES! 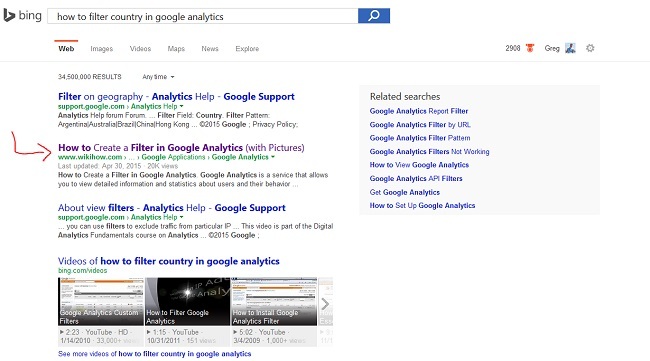 Here is a perfect example of when to use the Index Explorer tool within Bing. I recently changed a page on my site and 301 redirected that page to the new URL. I wanted to draw attention to this to Bing, so I used this tool. Simply put, you can find the page that you want Bing to recrawl the next time they crawl your site. Google has this feature too in Search Console, so don’t forget to tell Google about this page as well! Having both search engines know to look out for this page on their next crawl is not a bad way to get that paged indexed and ranked faster in both search engines. Want to know what pages you should work on? Bing has a great beginner’s SEO report that can let you know what pages need your attention. These SEO reports work the same way for Google. After I clicked on the error, I am brought to this screen below. Bing right here actually gives me the reason why this is important for me to update. Good to know. I can also put this URL into the SEO Analyzer section within Bing to see where the error is. The best part about this is that I can see in a visual way what needs to be added/fixed on my website. After I put this in the tool, I not only see that I have forgotten the meta name description, but I also forgot to add an ALT tag to my Bing Ads Accredited badge on my website. Go me! I sort of get this odd feeling of excitement when I notice I have errors on my site. As any SEO knows though, you can only do so much on-site fixes for your site. Let’s take a look at some external factors that can help improve your SEO in general! This is probably one of my favorite sections within Bing Webmaster Tools. First, I don’t pay for link research tools, so a free report is always good in my book. Second, I can see the trend line of links acquired for my site. Third, I can see what pages have the links to them. Fourth, I can expand upon what pages I want to see the link/s from. Fifth, I can see the anchor text that is used from these places. Understanding what is linking to your site will certainly help you rank better within Google and Bing, so you should be keeping a record of the links to your site in excel. If you notice a drop (or jump) in rankings that seem out of the ordinary, I would suggest taking a look at the links to that page / site for as far back as you can go. You might discover that you lost a lot of links to a page, so it is worth figuring out what those pages were and see if there is a way to get that link back. So, I am a big fan of checking out the links that I have for my website. Links still count, so you have to pay attention to this if you want to rank in both engines. Also, you should use Bing Webmaster Tools just to see if anything suspicious has happened overtime with your links to your site. Anyway, I mentioned that links are important, so what else can Bing Webmaster Tools do to help? How about we take a look at our competitor’s and see where they have links from! If any site outranks you on Google and or Bing for a particular keyword, I would paste that ranking URL into this tool to see the back links for their site. I can perform any search I want in any search engine, but I am just going to use Bing for this example. This link looks interesting, so I am going to paste the URL into this tool to take a closer look at who I am dealing with. As a note, I think the title tag on this SERP listing is totally spot on. I would absolutely click on this even though it is not the first listing in Bing. I simply pasted in the URL below and clicked on the explore key. I am shown a few listings that link to this website which is pretty helpful. Always important to see where link opportunities lie for whatever website you have. Hypothetically, I can say that I’ve done my crawl research and my link research, so what else can I do? This is where I would head over to the page traffic section to search my keywords for my website. This section might look similar to Google Search Console, so this won’t be as confusing if you are familiar with that tool. What is a bit cooler though is that you can see how important it is to move up the SERP for a keyword. Check this out. I can expand a keyword to see what happens when that keyword changes it’s rank within Bing and Yahoo. Why is this important? Well, I would suggest this. If you notice that you rank in the middle of page one for some keyword in Google and Bing, I would suggest playing around with a different title tag. Let it run, ask Google and Bing to recrawl the page to get the new title tag seen in the SERP for the user, and then watch the data until you have enough data to show you something interesting. Maybe you see a better click through rate, or maybe you see something worse. Either way, you should also be testing! I really do hope that these seven things opened your eyes on what this tool can do for your website. There is just so many more sections within this tool, but I will stop here. I would love to hear what you guys think. Do you use Bing Webmaster Tools? If so, I am curious to hear what you use when you use the tool? If you are looking for help, I offer SEO Free Audit along with Boston SEO Expert services that will include Bing optimization.